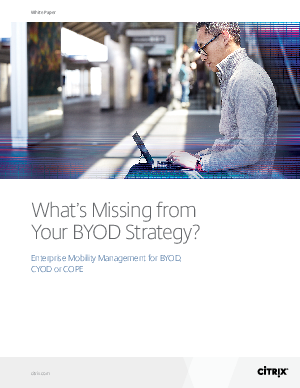 > Citrix Systems, Inc. > Whats missing from your BYOD strategy? Mobile device programs play an important role in enabling enterprise productivity. However, mobile device management (MDM) solutions have led to poor user experience, privacy concerns, security risks and ballooning costs. Enterprise mobility management (EMM) is a far better approach to managing personal devices in a corporate setting at scale. Learn how XenMobile uses EMM to enable BYOD and CYOD/COPE mobility programs without impacting user experience, and without inflating costs or introducing security risks.